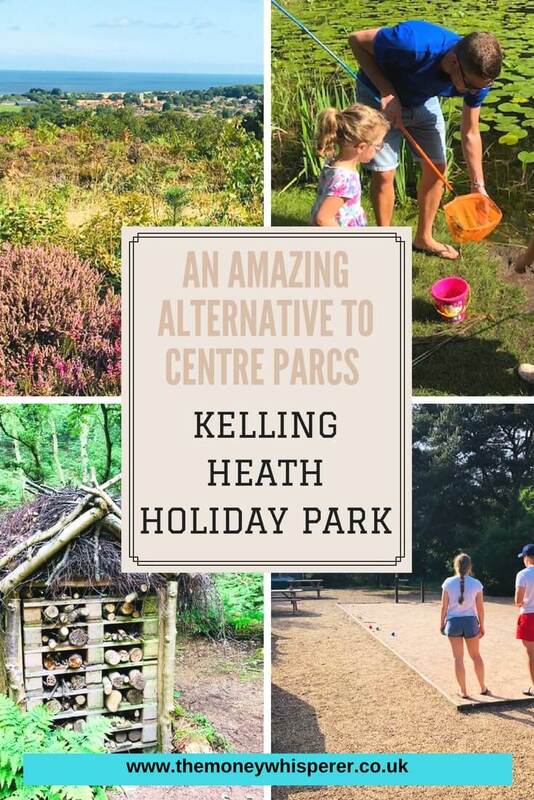 If you are a fan of outdoor holidays and looking for an alternative to Centre Parcs but without the price tag, Kelling Heath Holiday Park is just the place you’ve been looking for. It’s a little gem of a place, tucked away in 300 acres of woodland and heathland in beautiful north Norfolk. We’ve just spent the week of half term there and couldn’t have had a better time. It’s our home away from home, a very special place for our family. If you’re taking children on an outdoor, adventure holiday, they are going to ask where the pool is! 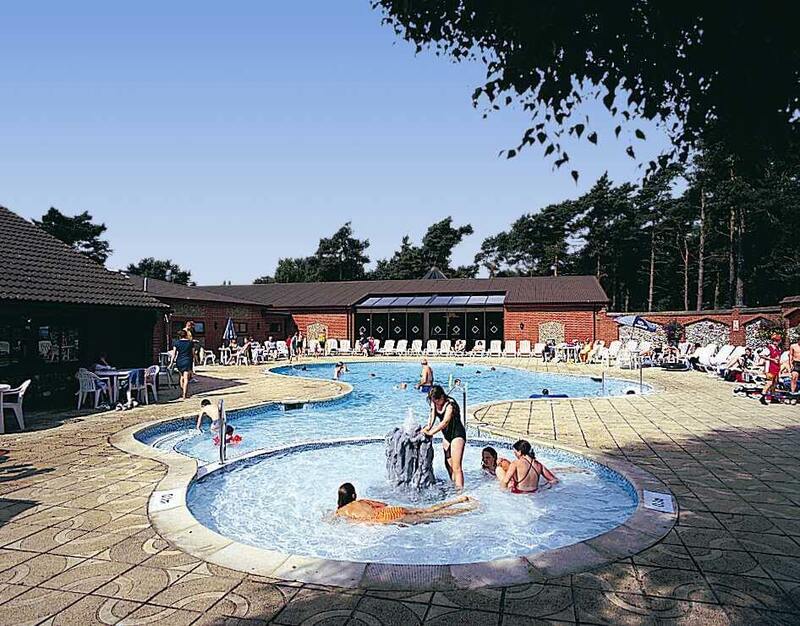 Fear not as Kelling Heath has both an indoor and outdoor pool. The outdoor pool and toddler pool, open late May to the end of August, is available to all guests free of charge. We are fortunate to have membership to the Health & Fitness Club which includes the indoor pool, sauna, steam room, jacuzzi and gym. We visit every day because our girls are little mermaids! It’s great if you have a rainy or cooler day. Daily, 3 day flexi passes and weekly passes to the Health & Fitness Club can be purchased by holiday makers. It’s far less busy than the outdoor pool and beautifully clean with plenty of locker space and great shower facilities. I wouldn’t be able to say that Kelling Heath was a holiday park like Centre Parcs without it being all about the bikes. There are miles and miles of woodland and heathland trails for both walking and cycling. Although there are cars on site, the biking is very safe and a lot of the trails run through woodland paths where there are no cars at all. My girls love cycling to the Hide first thing in the morning to see if they can see any deer or foxes. The site isn’t so big that you need to have a bike but to enjoy the beauty of the site, I would recommend it. If you don’t want to take your own, there is hire available on site from Huff and Puff Cycles. The Village Square is the hub of the park. Scattered around a central pagoda which houses the nightly entertainment (during peak school holiday season) are plenty of tables for enjoying either a meal from the restaurant or a drink from the bar. Stevie Spud and Donut Dave are huge hits with my girls – an hour of children’s entertainment and dancing before dinner. This is followed by entertainment for all the family. Activity wise, there is plenty to do. Tennis courts are located in among the trees in a beautiful spot just down from the Square. There is table tennis and petanque at the Village Square which are always popular. If you don’t have the gear, it’s available to buy at the village shop right next to the petanque area. 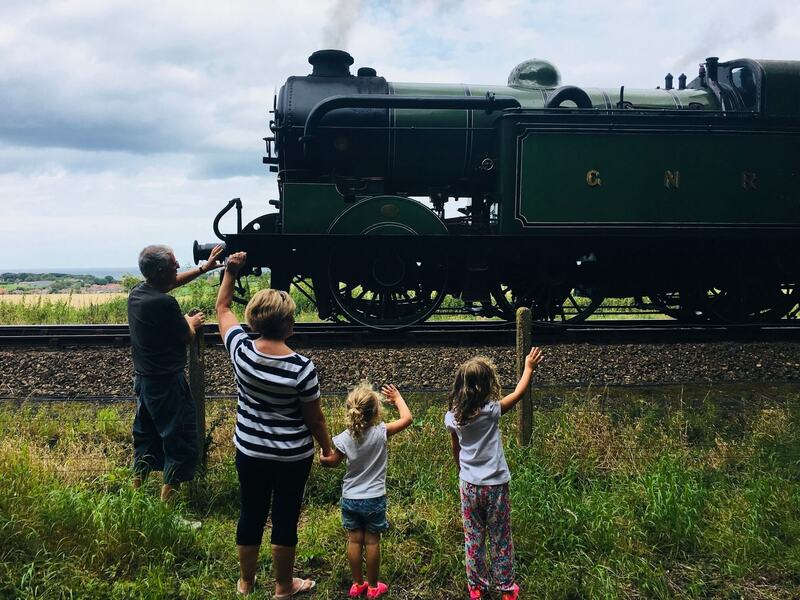 Children will love the adventure playgrounds, searching for frogspawn in the pond, fishing at the fishing lake and waving to the steam train as it passes by Kelling Heath’s own stop on route from Holt to Sheringham. Train lovers will be in their element with this old-fashioned train! It has carriages like in a Miss Marple film and is run solely by volunteers dressed in old-fashioned clothing. Wildlife Walks– Wrap up warm for family winter wildlife rambles, wake up early for the Dawn Chorus and stay out late for Noises of the Night walks. Join the specialist led Wildlife at Dusk team to find the rare nocturnal Nightjar that lives on the heath. 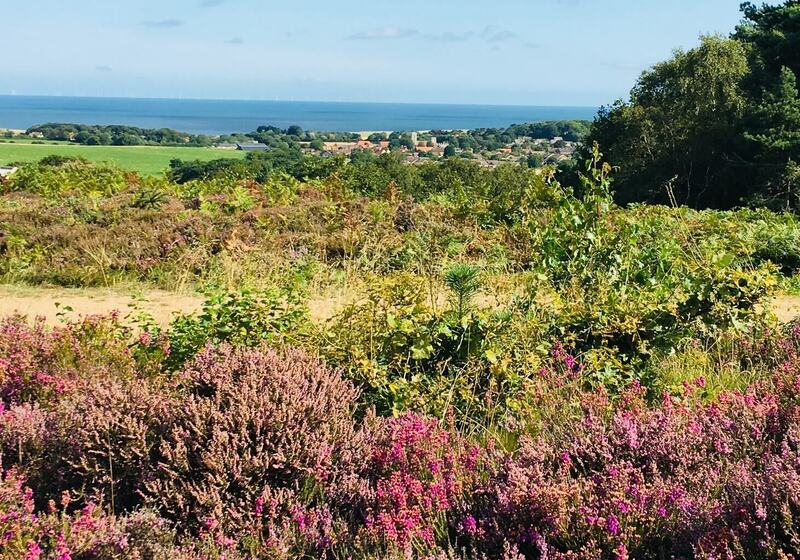 Kelling Detectives– Search for the seasons with the Kelling Detectives who meet weekly during the school holidays. Record your route with a fascinating journey stick. 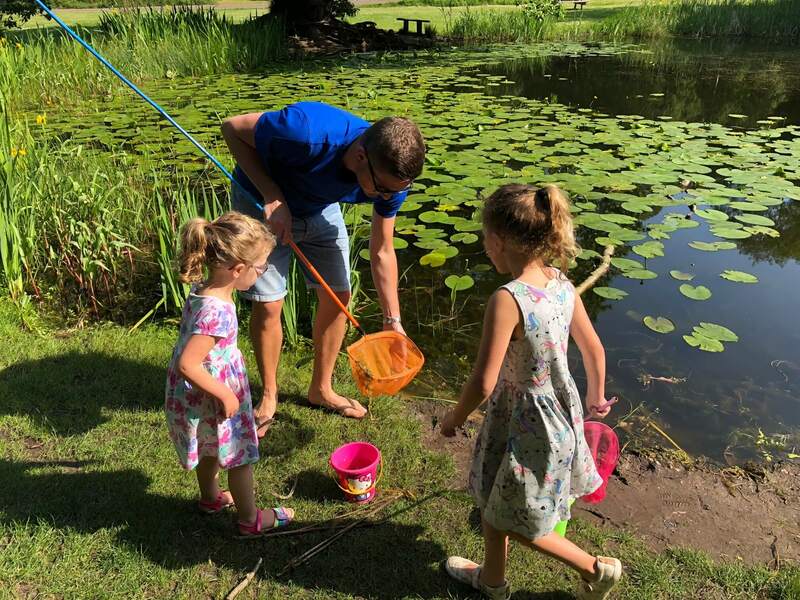 Discover who is enjoying life in and around our ponds teeming with wildlife ending the morning with a natural craft session in the Village Square. Kelling Explorers– Nature inspired activities for guests aged 3 – 7 years. Welly Walks, Woodland Rambles, Pond Dippers, Painting and Mask Making and much more. Acorn Active– Sporting activities include Archery and Football sessions. We enjoy riding our bikes around the park and exploring all the amazing nature-based activities. 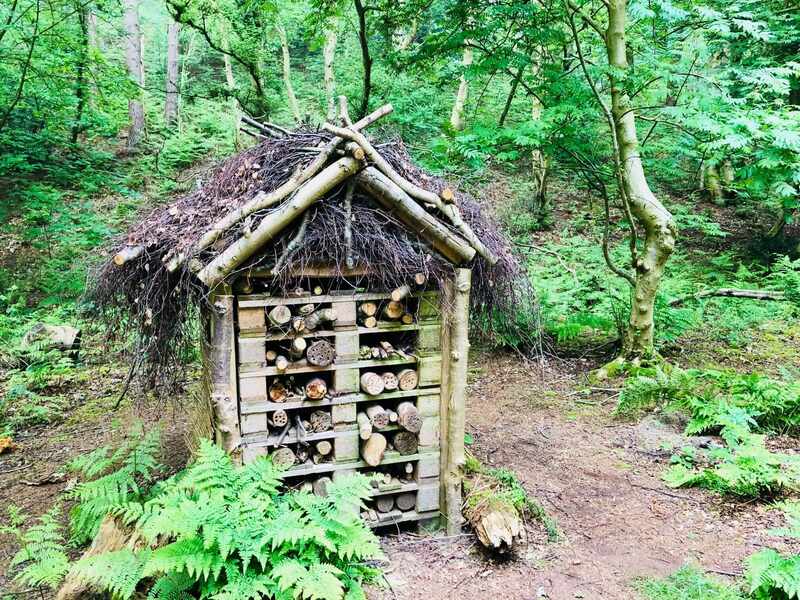 There is a gigantic bug hotel on the way down to the fishing pond. Great for nature exploring. Visiting the Hide to view the wildlife is something my girls ask to do as soon as they wake up each morning. There is a chalk board in there for people to record what they’ve seen and they often have a giggle making up that they’ve seen hippos and crocodiles in the pond. For those in to fishing, there are five fishing platforms at the fishing lake. A great spot for train spotting too as it is fairly close to the Kelling Heath railway stop. The park is so beautiful nestled among the trees and wherever you choose to stay, the natural beauty of Kelling Heath is abundant. Obviously, the feel of staying in a woodland lodge is similar to Centre Parcs. They are stunning and actually, I prefer them to Centre Parcs as they are all individually sited so you aren’t in a terrace with anyone else like you can be at Centre Parcs. There is a lot more space. 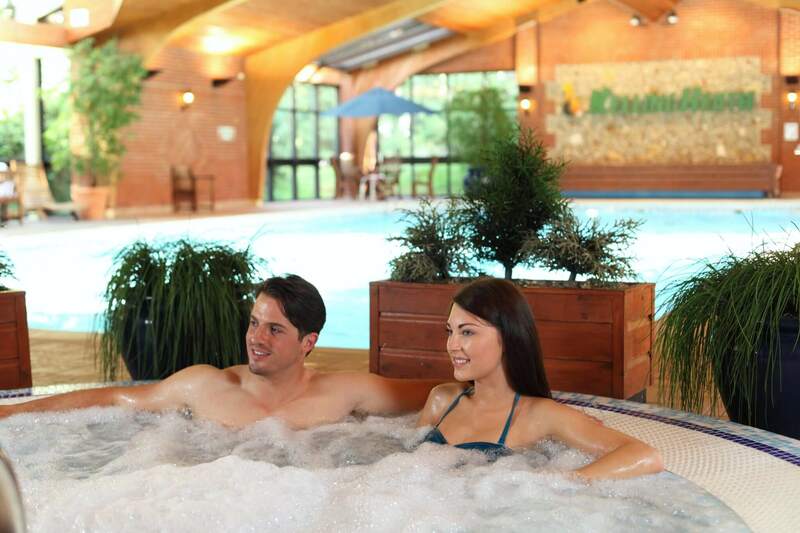 Guests get complimentary toiletries, bathrobes and membership to the Health & Fitness Club for your stay; this option really is a luxury alternative to Centre Parcs or a swanky hotel except with so much more room. 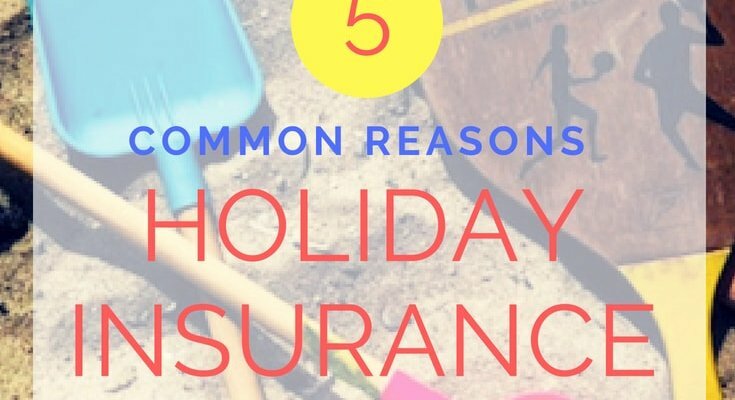 The other options are not as upmarket as a lodge holiday but the luxury holiday homes are positioned in such beautiful spots that you get a cheaper alternative and let’s face it, most of the time you don’t want to be inside your accommodation anyway on holiday, do you? The camp site occupies a lovely spot up near the heathland with its own Children’s Trim trail and playground close by. The facilities are superb as you would expect from a quality campsite, with a range of pitches available including fully serviced and hard standing. Catering very much depends on your accommodation type. Staying in a Woodland Lodge or Luxury Holiday Home means self-catering is easy as you have kitchen facilities available in the accommodation. There is a good-sized Tesco in Sheringham for groceries; a 5 minute drive or they also deliver on site to Kelling Heath. There is also a Budgens in Holt; a 5 minute drive the other way. 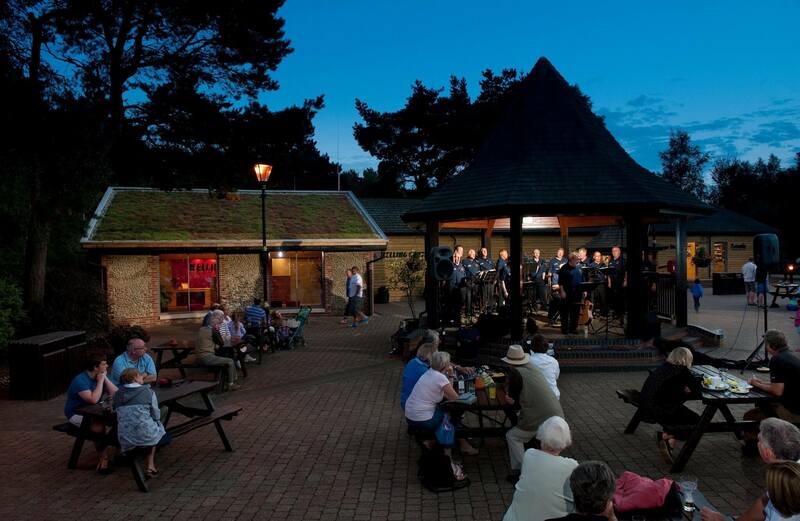 ‘Pizza on the Square’ where you can dine inside the restaurant, or choose from take-away menu and enjoy your meal in the Village Square or your own accommodation. The Forge & Terrace where you can choose from table service dining in the Terrace or the more relaxed pub style atmosphere of the Forge Bar. There are often pop up food stalls in the Village Square serving everything from waffles to nachos. The Village Store is open every day offering a selection of fresh local produce and a range of groceries, newspapers and gifts. 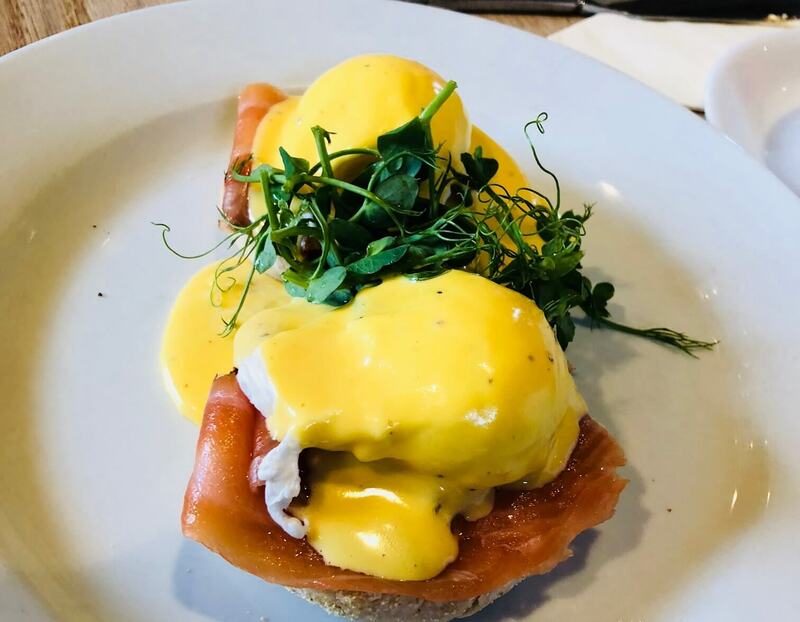 Holt is a beautiful, upmarket town and if you are lucky, you might spot Camilla Parker-Bowles as she enjoys a browse when staying at Sandringham. Fitting for royal visitors, there is a posh department store with a wonderful food hall in Holt – Bakers & Larners. They have a huge Cook food selection at the back of the store and I would highly recommend this for ease of enjoying your holiday. 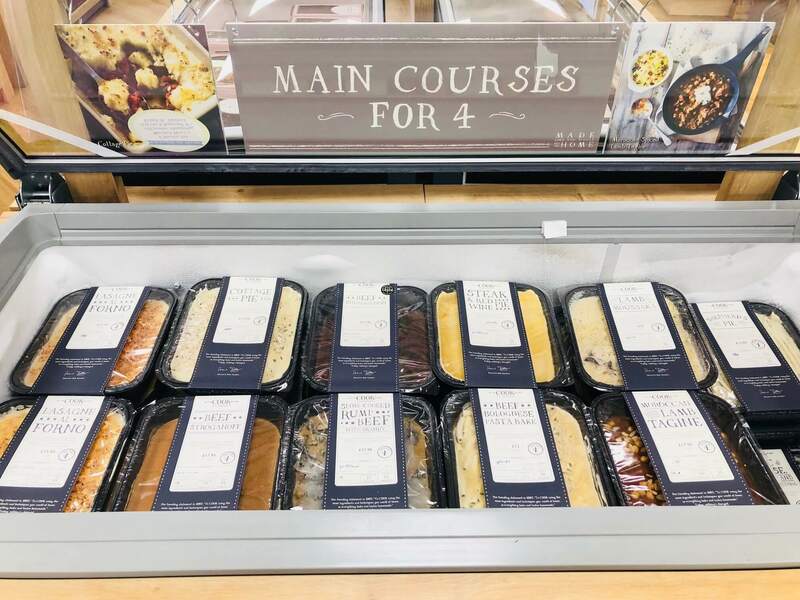 Buy meals for 2 or 4 and stick them in the oven for easy, delicious meals. Who wants to cook too much on holiday?! For those who enjoy eating out, ‘Back to the Garden’ does an incredible breakfast (and lunch and dinner!) which is a 10 minute drive from the park just outside Holt in Letheringsett. Scrummy! They also have a fabulous deli. Jump on the North Norfolk steam train and head either in to Holt or the other way in to Sheringham. When we visited at October half term, the station at Weybourne had been transformed in to an incredible Halloween trail – really worth a visit. 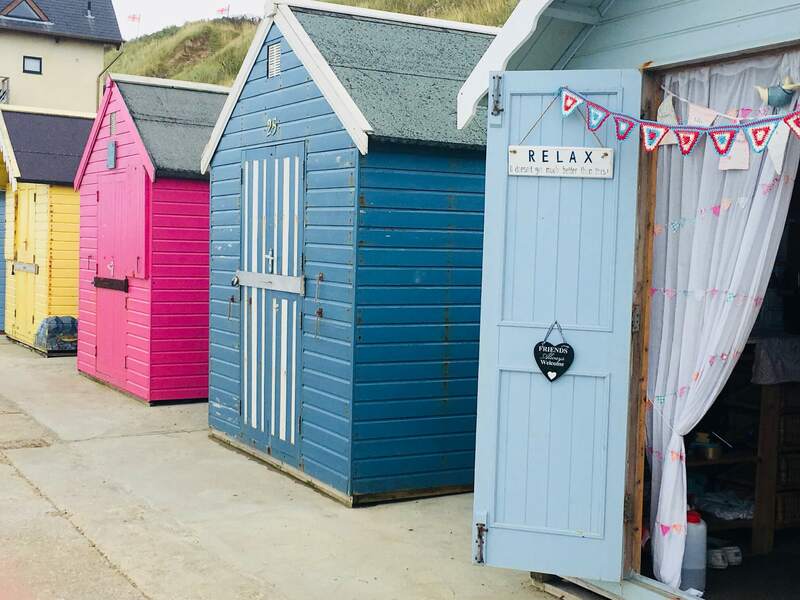 Sheringham is a bustling seaside town with plenty to do; arcades, old fashioned sweet shops, great fish and chips and of course, the beach. 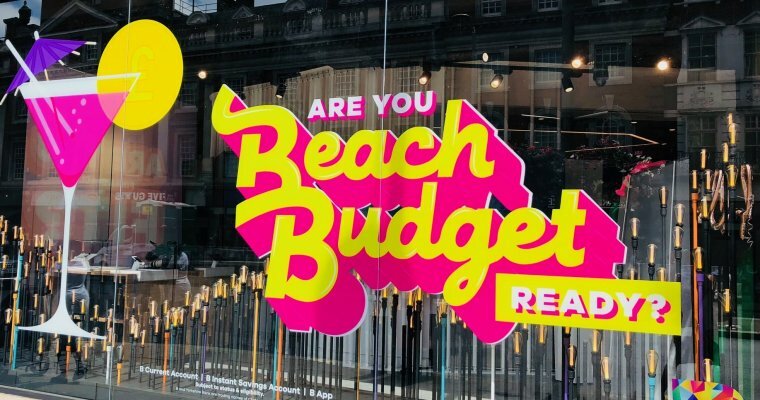 Don’t forget to take a look at the pretty beach huts. Blakeney is a 15 minute drive and hands down our favourite place for crabbing. Park on the quay (free with NT membership), ask for free fish heads for bait at the fish shop (donation suggested to local school) and take some spare clothes for after the kids have enjoyed sliding down the muddy banks at low tide. There are also seal watching trips which depart from the quay at high tide. West Runton is one of the closest sandy beaches and also great for rockpooling. Visit Cromer Pier for the traditional seaside pier experience. Holkham Hall is a beautiful 18th century house set in incredible grounds. We usually pack up the bikes on the back of the car and a picnic and enjoy cycling round the grounds, taking in the deer and picnicking by the lake. We also went at Halloween – see my review here. 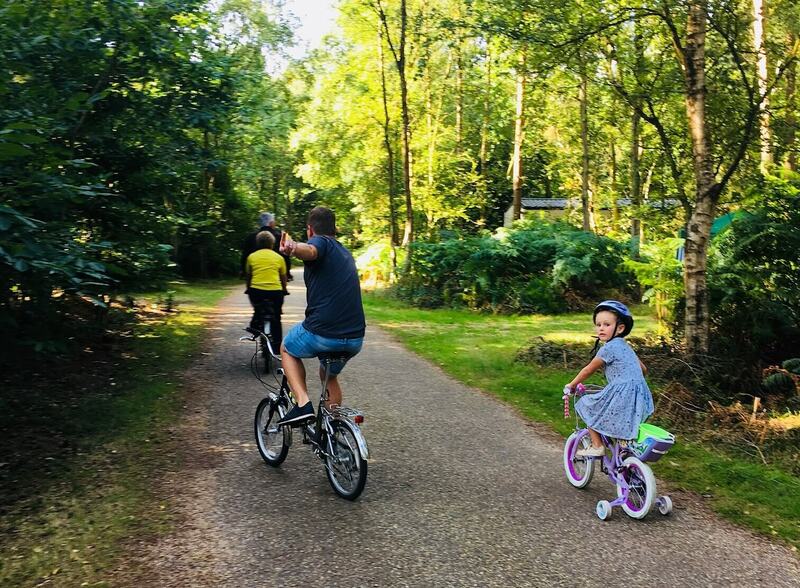 Anyone wanting to head a little bit further afield using Kelling Heath as a base, BeWILDerwood is probably our all time favourite family day out. It’s about a 35/40 minute drive from the park but well worth it, especially if your little ones have read the books and are keen to meet Swampy in real life. It is magical! Kelling Heath is our happy place. It is our second home and a place where we are happiest. It is amazing how being among nature and waking up to the sound of wildlife, seeing deer wandering on your lawn and being out in the fresh air makes you feel a million miles from home and real life. 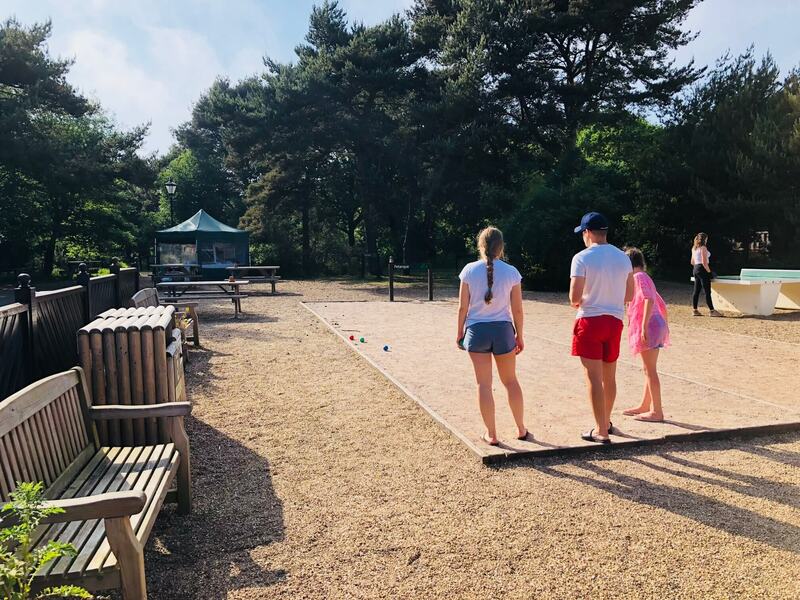 If you are looking for a cheaper alternative to Centre Parcs, with plenty to do and beautiful natural surroundings, you won’t be disappointed with Kelling Heath Holiday Park. Lovely holiday. Kelling Heath sounds a great place to stay. We’ve really enjoyed several summer holidays on the North Norfolk coast, makes me want to go back again! Thanks so much for joining #MondayMoney. It looks like a fabulous place Emma. 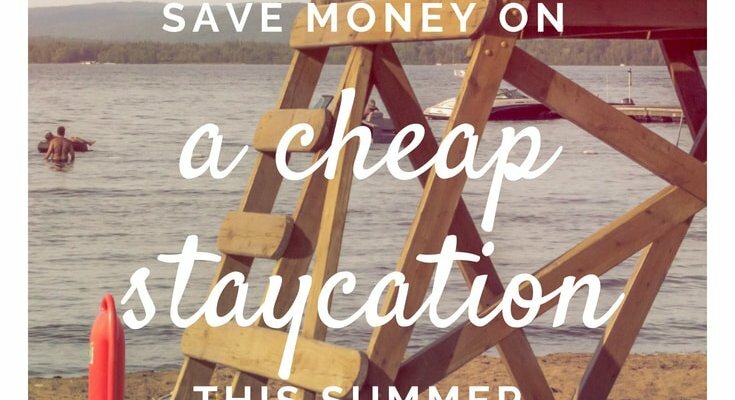 We have done loads of Centre Parcs holidays, but that looks like a great alternative. Wow, what a fab place. Looks great if you have kids and your right, looks so much like Centre Parcs. 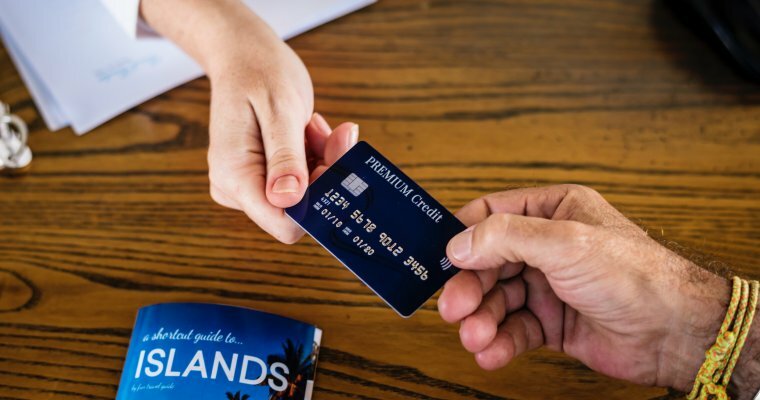 Thanks for linking up to #MondayMoney. Hope to see you next week. This place sounds amazing! Maybe an idea for a week in the summer holidays!